It is always more fun to have company on a run. Particularly company that doesn’t need to be talked to if you don’t feel like it. Dogs can make fantastic jogging buddies. They welcome the exercise and some breeds will go for ten or more miles without flagging. You do need to be aware of the weather conditions when running with your dog though. Dogs (and people) can get heat stroke when running in hot weather. Because your dog wants to please you, he is more likely to push himself past the point where he needs to take a break. It is important not to overdo it in hot weather, particularly with a long or medium-coated animal. Watch for excessive drooling, heavy panting, any signs of disorientation, or changes in gum color. Try to plan summer runs for early in the morning or evenings when the temperature has dropped some. Use grassy trails for running as your dog doesn’t have shoes to protect his pads from hot asphalt and always bring water with you for both of you. Not surprisingly the best dog breeds for running are those that were bred for stamina and natural athleticism like hunting, herding, and sled dogs. Avoid brachycephalic (short, pushed in face) breeds such as pugs, bulldogs, Pekingese when choosing a jogging partner. The extra short muzzle can lead to respiratory difficulties that are exasperated with heavy exercise. Dogs that have substantial amounts of bone such as mastiffs are also generally not suited for long runs either. The following breeds, in no particular order, make excellent running buddies, whether you run sprints or marathons. The GSP was bred to hunt at a gallop all day long in fields. They have energy to spare and are natural athletes. Their short coat is easy to maintain and they are generally a fairly healthy breed, typically living twelve or more years. The GSP is an ideal running companion, especially if you like long runs. 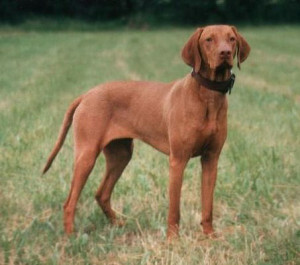 The vizsla was bred to do a similar job to the GSP. It originated in Hungary. They are slightly smaller than the GSP but, like the GSP, can keep up for any distance. Chances are good with both breeds, that given the option, your dog will cover twice as much ground as you do. Both breeds are good with children and people in general. They make great pets provided they get enough exercise. The weimaraner is another hunting breed that was meant to go all day. They are more prone to separation anxiety than the vizsla and GSP and may not be suitable to every home, depending on how much time they will spend alone each day. They carry more coat than the first three breeds and you do need to be more aware of heat issues with them. However, they are agile, easy to train, and very active. As with most herding breeds, they are more protective and can make good watch dogs as well. The GWP is as athletic as the other four breeds but more sedate in the house. Their wiry coat does need more maintenance than a short-coated breed but it isn`t hard to keep. DeBlasio all the way baby!